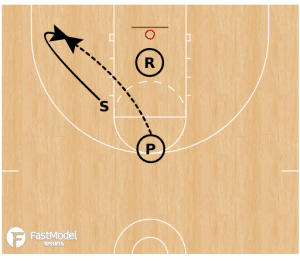 This shooting drill was contributed by Coach Fabian McKenzie to the FastModel Sports Basketball Plays and Drills Library. Coach McKenzie has been a head coach at the university level for 17 years, and has been involved as a coach at this level for 20 years. He has been involved with the Canadian Women’s National team program for the past 9 years. Teams line up as shown below. Player in circle cannot leave until pass is received. Pass is made to 1. 1 Dribbles in and takes shot. You can be as creative as you like, take shots from different spots or add moves at certain spots. 1 gets own rebound and makes outlet pass to next 1 in line. The passer sprints to the circle following their pass. 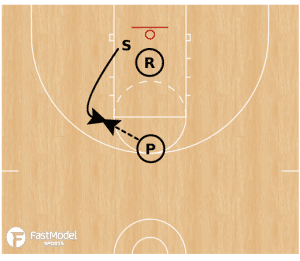 This competitive shooting drill is among the thousands of resources for both coaches and player available from basketballhq. They have several more videos as well as basketball coaching resource articles. This drill is coached by Ryan Panone. I encourage you to think about the best way to tweak the drill before using it so that it will offer the most benefit for your players. Even as you are first implementing it, you may need to continue the adaptation process of making some adjustments so that the drill contributes to the improvement of your players. Make sure that your speakers are on to hear the narration and that you can access You Tube to see the video. Click the play arrow to begin each video. 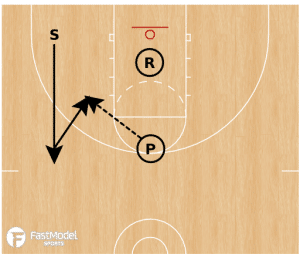 This shooting drill was contributed by Joel Hueser FastModel Sports Basketball Plays and Drills Library. Coach Hueser is the Head Boys Coach at Papillion-LaVista South High School High School in Nebraska. The comments along with each diagram are from Coach Hueser. 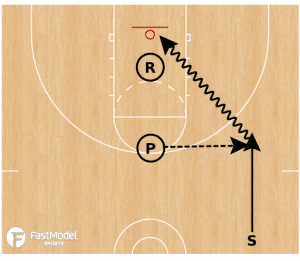 The purpose of this post is to get your thoughts going about creating a similar drill that incorporates the shots that your players get in games. In addition to game spots, I like to have shooting drills include a scoring and timing element as well. Shooter starts at half court (or top of the key extended if space doesn’t allow), catches on the move and attacks the basket. -Catch on the run and attack the basket with a 45 degree angle cut. Shooter continues his cut to simulate using a pin down screen and shoots near the freethrow elbow. This will be the same as shot #1 but on the opposite side. There are two ways to do this: 1) Sprint to halfcourt, or 2) Cut hard to ball level and simulate a back cut. We prefer this more times than not. -Shot #5 & #6 will also be the same as #2 & #3. 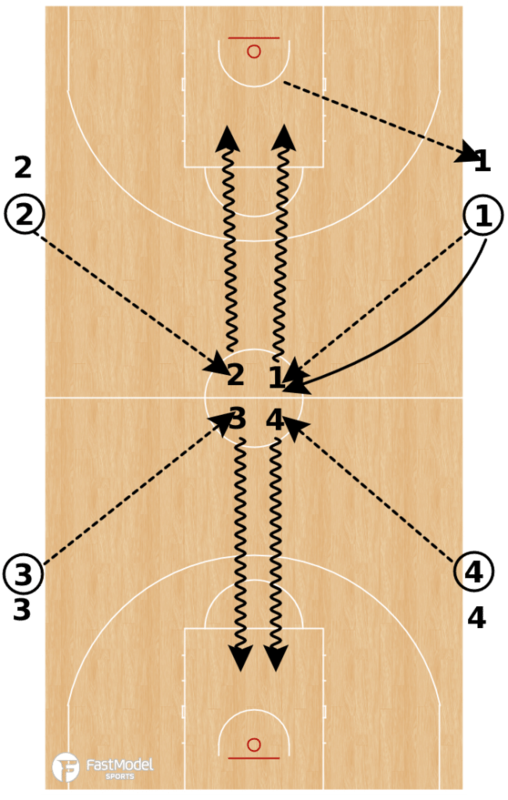 -After the 1st shooter is done, the passer becomes the shooter and the rebounder passes. -Repeat this again, but start on the opposite side. Even the best shooter are going to run into a slump at some point. 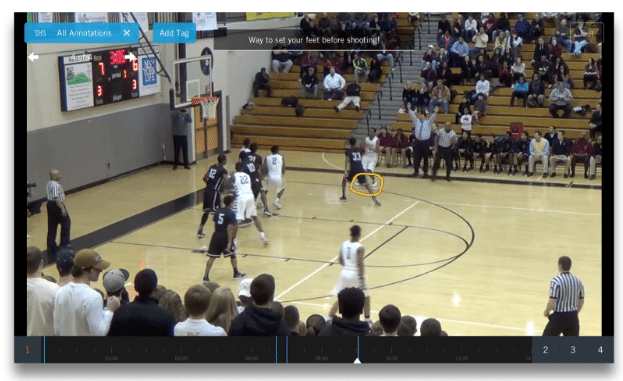 Hudl provides some tips to help get your marksman back on track. Following a 2-for-7 outing on Nov. 7, Klay Thompson was shooting a frigid 22.9 percent from 3-point land on the season. One of the best shooters in the league (and maybe NBA history), the Golden State guard had bricked his way to a worse 3-point percentage than Tony Snell, Marcus Smart and Emmanuel Mudiay, players routinely ignored by opposing defenses from deep. It’s not that Thompson forgot how to shoot. He was just going through something even the game’s finest marksmen experience – a shooting slump. Not even the most prolific shooters are immune to slumps. The question is, how do you escape it? Thompson clearly found his way. Since the rough start, he’s shooting 47.5 percent and is once again the force of nature that has foes wincing every time he pulls up. You may have some players who aren’t shooting as well as you know they can. Here are four ways Hudl can help get them back on track. When a shooter is feeling it, the rim looks a lot wider than 18 inches – it appears as cavernous as the Grand Canyon. On the same token, a slump shrinks the hoop to the size of a pinhead, impossibly small to squeeze a basketball into. This is the mental game that every athlete fights at some point in the season. Most of the time the player’s mechanics are just fine, but his head is in the wrong place. He just needs to be reminded of his ability, and the shot tends to come back quickly. Be very positive with your players. Stress their talent even amidst some struggles. Create a playlist with clips of hot streaks from previous seasons to remind them of their ability. Pepper in some notes in the video to pump your shooter up. Every player has certain areas of the floor that he’s more comfortable shooting from. Maybe your struggling shooter isn’t finding these spots or you as a coach aren’t running plays that put them in optimum scoring position. 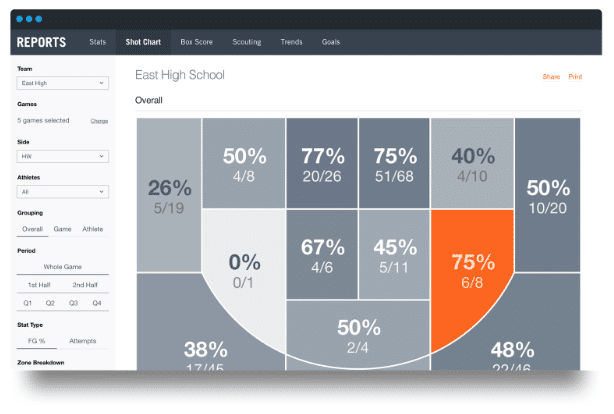 Take a look at your athlete’s shot chart to get an idea of where they’re most accurate from. Try to design plays that will get them more shots from their hot areas, and have them run drills in practice that will help them improve from the cold zones. By watching video connected to the shot chart, you can also discern if your player is taking quality shots. Is he rushing his shot from certain areas? Is he taking too many contested looks? Sometimes the solution to finding one’s shot is simply getting closer to the basket. Great shooters thrive on hitting shots from outside, but getting into the paint can provide a confidence boost if the long ball isn’t falling. Not only will the shooter get some easier looks by coming in close, but he will also have a better shot at drawing fouls near the rim. There are no easier points in the game than free throws, especially for a knockdown shooter. This step requires an important balance between fixing flaws and overanalyzing. You want to hit that sweet spot of suggesting minor changes in technique versus getting players to overthink their motion on every shot. But if a player is struggling to find his groove, it’s important to correct any flaws in his form. Go back and look at video from previous seasons to see if there is a hitch in his shot. The shot chart helps in this area as well. One click will pull up a playlist of all the athlete’s shots from that area, so you can see if he’s fading away, not setting his feet or rushing his shot. If a particular section of the court is bothersome, put together a plan to work on from that spot in practice. No two athletes respond to struggles in the same manner. Some will get a mental block that affects their confidence, while others have the self-belief to keep firing, believing they will shoot themselves out of the slump. Make sure you’re approaching the situation on an individual basis. For some players, the answer might be to get in the gym and shoot for an extra 20 minutes each day, ironing out the issues with their shot. But that same strategy might cause another individual to overthink. For that athlete, not mentioning the slump at all might be the best tactic. No one knows your players better than you. Tailor your correction strategy on a personal basis to help pull the player out of his funk. This video is from the great resources available from basketballhq. They have several more videos as well as basketball coaching resource articles. The Coach in the video is Brian Baudinet, formerly an assistant coach with the NBA D-League Tulsa 66ers. Since the video was made, Coach Baudinet has taken a position with the Duquense University Men’s Staff and the Tulsa 66ers are now known as the Oklahoma City Blue. I hope you might be able to take this video and modify it so that it is useful within your program. You can always change the types of shots or the rules (such as shooting until you make) to make the shooting game fit the abilities of your players. You can also change the number of points to get a win. Players can compete against a team best, against their personal best, or against players at other baskets. It is also a drill where you can make the standards more challenging as your players get better at playing this shooting game. Please make sure your sound is on to see the video. Click the play arrow so see the drill. The drill is a You Tube video, so you will need to be able to access You Tube to see the drill. Mike Neighbors, Women’s Coach at Arkansas (Previously at Washington) is one of the best coaches around to learn from. Hopefully you were able to see his 2016 Women’s Final Four team play, or see him at a clinic, or both. He sends out a weekly basketball coaching newsletter. If you are interested in being added to his list, let me know and I will pass along your email address. His newsletter is on hold at this time while he is transitioning jobs. Editor’s Note from Brian: The object of the game is, like golf, for the shooters to accumulate as few “Up Points” as possible. As a result of having a larger team than we have had the last few years, we have had to become a little more creative in our use of space/goals/time. This seems to be most true in how we use our time with free throw practice. This is one we came up with this week. It’s a morph of several other shooting drills we have utilized in the past. All six goals. Each goal being scored individually. Shooter will attempt two shots then rotate to the next goal. If the shot is made…it puts 1 point up. If the second shot is made… that would increase the UP total to 2. The score at that goal continues to rise every made shot as the various players are rotating through. When a shot is missed, the player who misses GETS THE NUMBER THAT is UP added to their score. You have scores building at each goal as the players rotate through. We rotate rebounder to shooter, shooter to next goal so that the UP count can be relayed. As you do this a few times you will see that your “smart’ kids will learn NOT to follow the best FT shooters, so it will be up to you to place shooters accordingly. We keep a running total score for the week/year so that we can strategically order the shooters to best keep it competitive for all!! The first time we did it, we did for 10:00 total. Once the time expired, we kept each goal going until there was a miss at all of them and all the total UP points went to someone. That keeps all players rotating around one goal until there is a miss. Creates one last chance to hang a big number on someone. So far this drill has been able to create some pressure situations and also give us best possible use of our free throw time. We also use this as water break and a catch breath time before we head into most physically and/or mentally challenging part of practice.